We expect all the talks to be deeply technical, given by designers and implementors to designers and implementors. We all speak Code here! 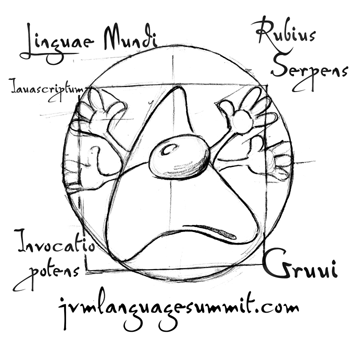 These talks, we hope and expect, will inform the audience, in detail, about the state of the art of language design and implementation on the JVM, and the present and future capabilities of the JVM itself. (Some will do so indirectly by discussing non-JVM technologies.) Beyond that, these talks will inspire us to work together with JVM-based technologies to build the next great software systems. The summit conference runs a full three days, September 24-26. All talks are in Sun’s Stanford Conference Room (SCA05-1116); it is set up classroom style. The first talk is at 9:00 each morning. Light breakfast food is available before talks start, at 8:30. Non-Sun attendees must be badged at the Clock Tower reception area; badging starts at 8:00. Talks range from 20 to 60 minutes in length, and are grouped in four 60- to 120-minute blocks per day. There are openings for impromptu “lightning talks” and time set aside for open “unconference” style interaction. Lunch is served on site. A breakout room is available for quiet conversation or ad hoc consultations. Each day closes with about 60 minutes of less structured time. The schedule ends at 5:30 each day. Please use the wiki. The conference password is on your agenda card. The conference will be recorded professionally by InfoQ.com, who will be posting them on the internet. We encourage you to allow your talk (including audio and slides) to be recorded and posted. We will not do this, however, without a signed release form, so if you do not wish your talk to be recorded, simply do not complete the release form. If you mark the indicated spot on the speaker release form, we will put your talk’s PDF (or other presentation file) on the conference wiki, so that the other conference participants, and the rest of the world, can see it there. All talks are held in Sun’s Stanford conference room, which has an overhead Infocus projector with a VGA connector. Please send PDFs of your slides in advance to Brian Goetz, so that we can have them ready to project from our laptop. But, if you plan to present from your own machine, please make sure it can talk to a VGA connector. (Macs generally require an adapter to do this.) To allow last minute debugging of AV connections in a private setting, there will be a ready-room (the MIT conference room) adjacent to the main conference room. We will also supply a clip-on microphone.